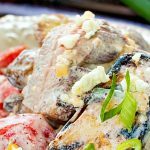 Black and Bleu Potato Salad, blackened flank steak is mixed with grilled potatoes and corn, coated in a luscious bleu cheese dressing! Are you in for a treat today! 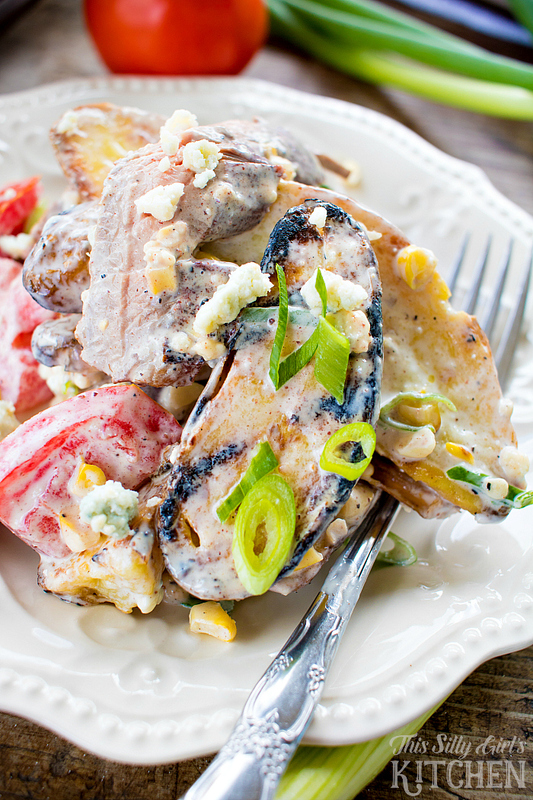 This is one of the most epic potato salads I have ever made, or tasted! 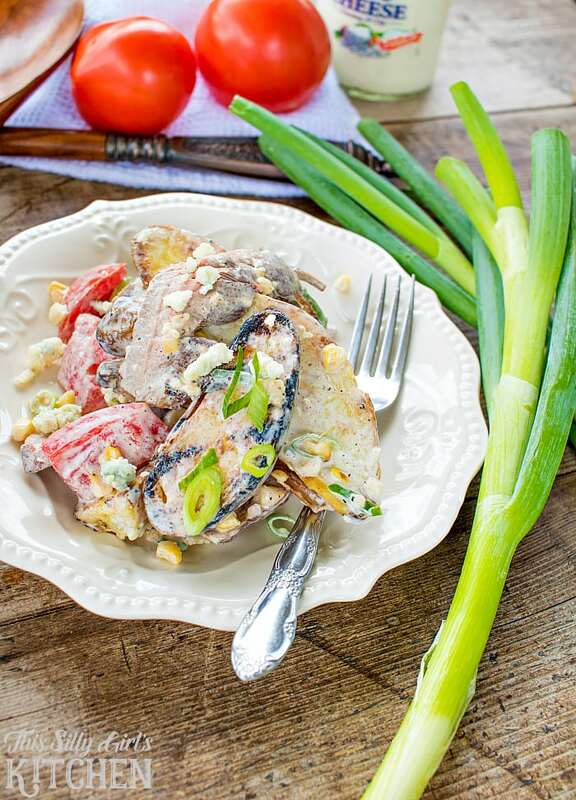 It really is a meal all in itself, but works wonderfully as a side dish to any meal, especially great for summer gatherings! 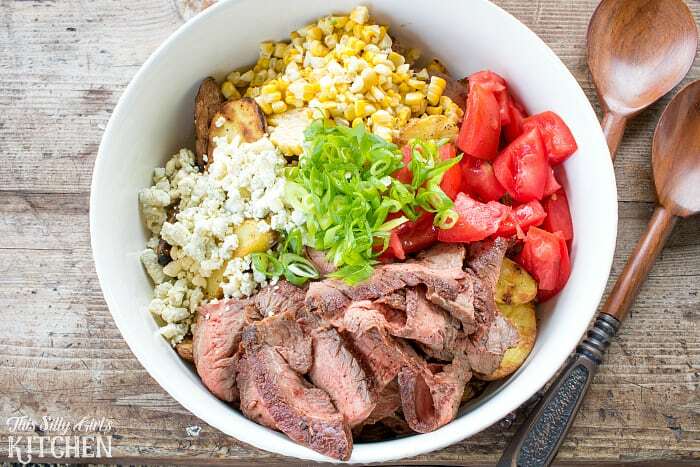 It is loaded with bleu cheese, fresh grilled corn, fingerling potatoes, scallions and blackened flank steak, all tossed in Litehouse Bleu Cheese Dressing! You know Litehouse, that dressing you can find in the refrigerated section in produce at your local grocery store? You know, it really makes sense. Cold dressing, for a cold salad. I have always instinctively reached for the bottled dressing at room temperature at the grocery store, it was just what I knew. But let me tell you, cold is where it’s at! 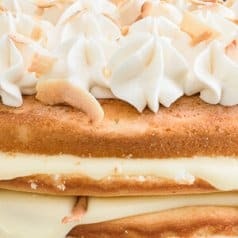 For today’s recipe, that is just what I did. I cooked everything off ahead of time, let it come to room temperature then threw it in the fridge to get cold. Then, tossed it in the dressing, it worked perfectly and tasted so fresh! Perfect for summer. Wash potatoes and place in a large stockpot. Cover with cold water, bring to a boil and let cook until just done, about 15-20 minutes. Drain, allow to cool to the touch. Cut in half lengthwise. Set aside. Season steak with blackening seasoning. Set aside. Prepare grill. Right before grilling the potatoes, toss them in the olive oil, salt, and pepper to taste. Grill over high heat, turning to achieve grill marks. Take off the grill, set aside and allow to cool completely. Grill flank to the desired doneness. Cook corn at the same time, allowing to get charred on all sides. Take off the grill, set aside and allow to cool completely. Place potatoes, steak, and corn in the refrigerator until cold, about 2 hours. Cut steak thinly on a bias. Cut corn off the cob. Seed tomato and cut into large chunks. Thinly slice scallions. 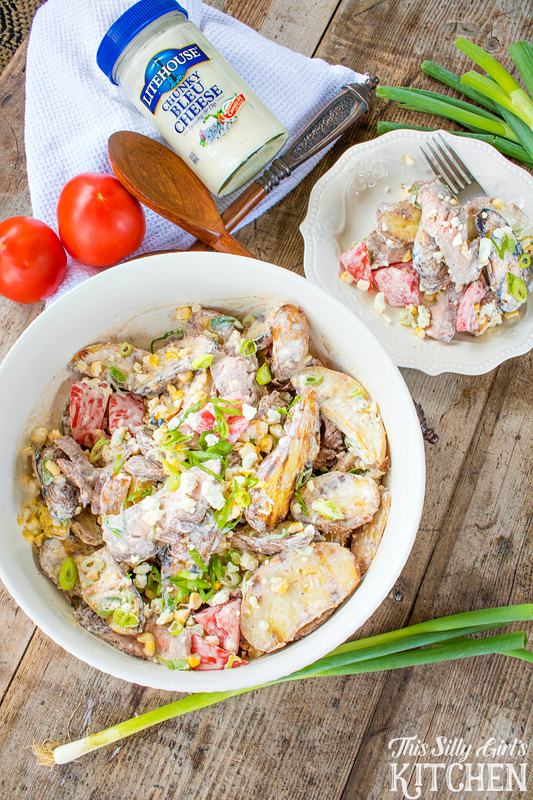 Add the potatoes, steak, corn, tomatoes, scallions and bleu cheese crumbles to a large bowl. Add Bleu Cheese Dressing to coat, taste, adjust seasoning if needed. Serve and enjoy! Seriously, how can you not love this? 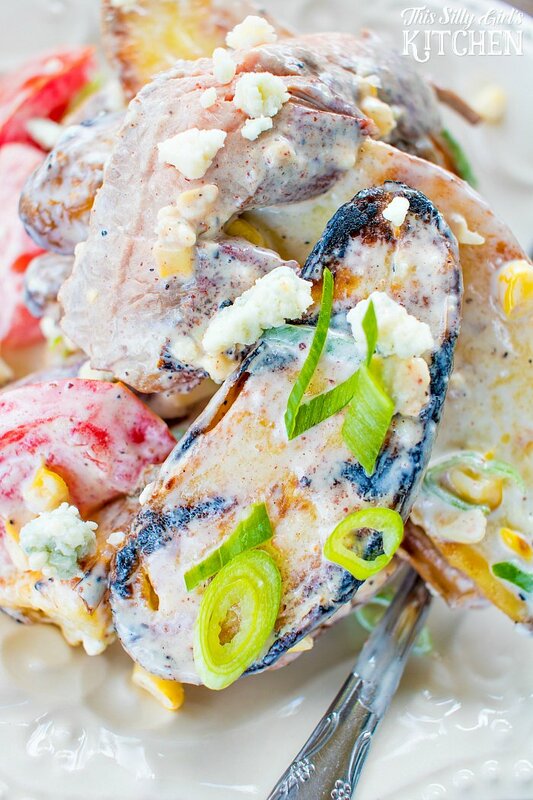 Okay, maybe you’re not crazy about bleu cheese? Easy, use your cheese of choice in the salad and use Litehouse Ranch Dressing instead. BOOM. Done. Grilling all the elements gives that little extra something to this dish. 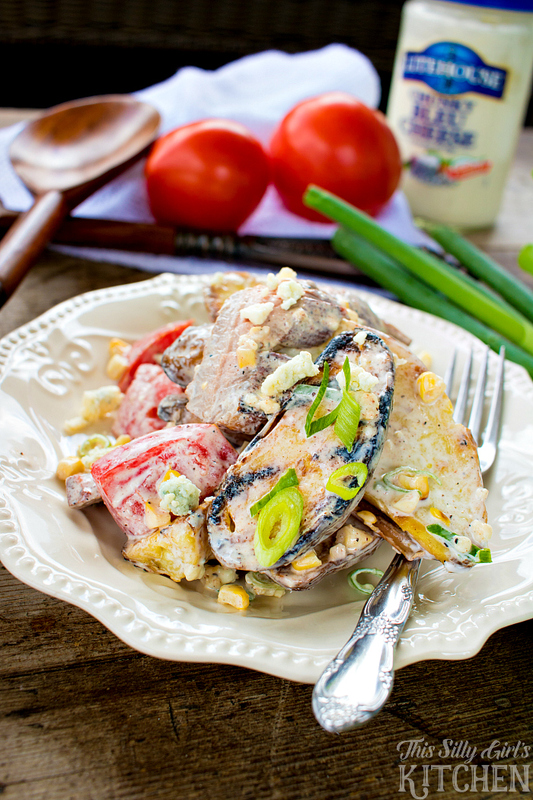 Smokiness from the grill, salty kick from the bleu cheese, sweetness from the corn, this potato salad has got it all going on! Thanks for stopping by! 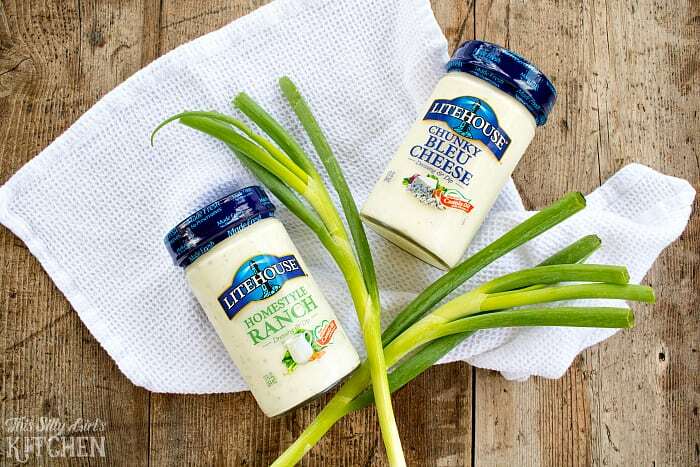 Have you tried Litehouse dressings yet? Which flavor it your favorite? 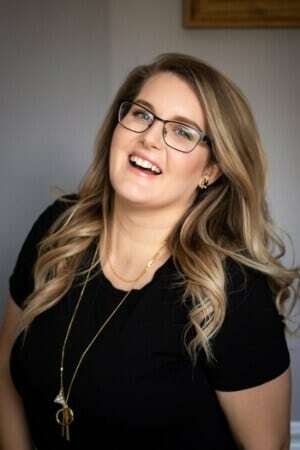 This is a sponsored post written by me on behalf of Litehouse. 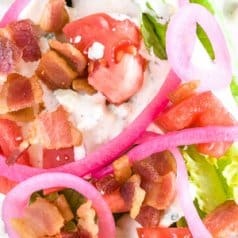 This looks so yummy… maybe a salad I could make in a mason jar for on the go? Thanks for the recipe! 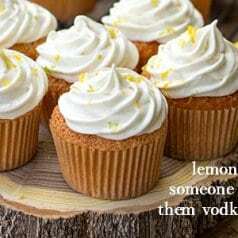 Sounds good to me, yum! oh, I like the idea of adding cold salad dressing vs. the warm stuff!